Welcome to Riverside Shopping District. Riverside is a serene neighborhood with an eclectic assortment of homes nestled between the river and the mountains. Lots of parks, lakes, and trees increase the surrounding beauty. But, is trouble brewing beneath the peaceful veneer? The neighbors include freewheeling singles like the Anderson and Ross households; large nuclear families like the Jeffersons, and Marshalls; and multigenerational families like the Molyneux and Russells. Each family has its own challenges to face, in its own way; and whether they triumph or succumb to despair, only time will tell. You can read about our residents, their houses, and the community lots in the comments for this thread. In addition to the playable families, Riverside contains a number of townies; however, it was built on empty templates and the townies were built to match the original ones shown in the preview pictures. They are not the Pleasantview townies, and care has been taken to ensure that no sims unnecessary to the vision were created. Although we have a variety of families already living here, there are plenty of new homes to choose from. You'll be glad that you decided to join our community. New homes are completely unfurnished, so be sure to bring your old furnishings or stop by the furniture store before you come. You'll find information in the comments about a small selection of the houses for sale in Riverside. To view the rest, be sure to visit our lovely neighborhood. This is a recreation of Maxis' lost neighborhood. As many of you know, Riverside was meant to be the only neighborhood featured in The Sims 2 during early production. During this time, Maxis released a series of screenshots of Riverside and its amazing lots. 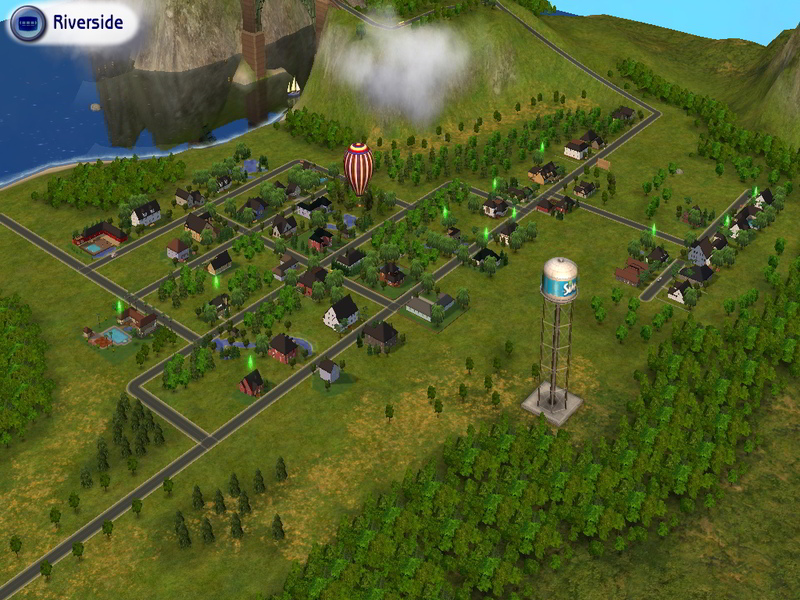 Later on in development, Maxis decided to destroy Riverside to make way for three new Sims 2 neighborhood. In the process, this great neighborhood was lost and forgotten. After finding a Riverside hood made by Thsms204, which was incomplete and corrupted, we decided to make a complete, safe, base-game version of Riverside for all to play. 1. Download the rar file RiversideShopping.rar. 2. Double click on RiversideShopping.rar to unpack. - You can temporarily move the shipped B001 (Business District) folder somewhere else. Then, your new subhood should be available to be installed by clicking on the large button. Be sure to restore the original shipped neighborhoods after you've installed your new subhood. This shopping district does not require a camera mod. All lots are visible in a vanilla game, although you will not be able to see all of the lots at the same time. You may need to rotate the camera to see some of the lots. Some players may not see all the "Story Telling" pictures, if so please let us know. Though the scenarios described in the neighborhood story and household description were created with care, certain functions of later EPs may interfere with their realization; for instance, the trashed bathroom in the Molyneux house may be cleaner and less broken than expected. The developers have done their best, however, to ensure that every player entering every household walks into the middle of some challenging situation. Enjoy. 256 people have said thanks to The Riverside Group for this download.